It was not unusual to experience damage at Pinetree Line radar stations due to high winds. What is unusual is the apparent lack of a compiled document that provides details indicating "what happened, where, and when". 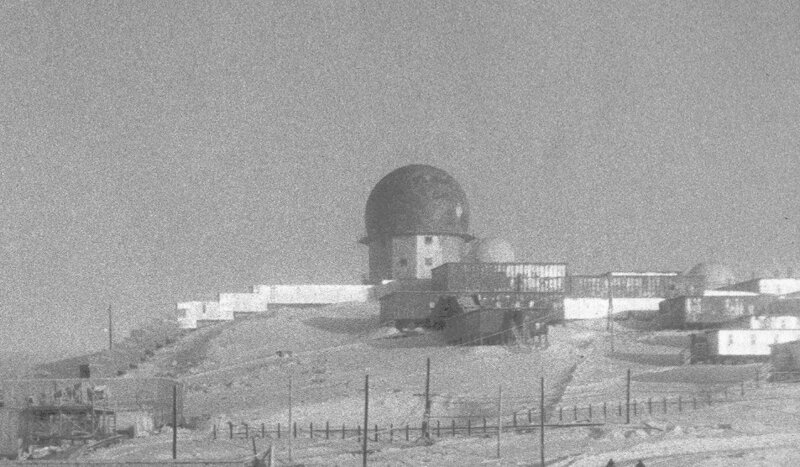 This file contains a summary of "significant" Pinetree Line radar station "wind damage" that is known, and documented, to have occurred at Saglek Air Station. The following detail has been extracted from the Historical Reports for Saglek Air Station. Two storms, on 4 and 12 July, caused considerable damage to power lines. 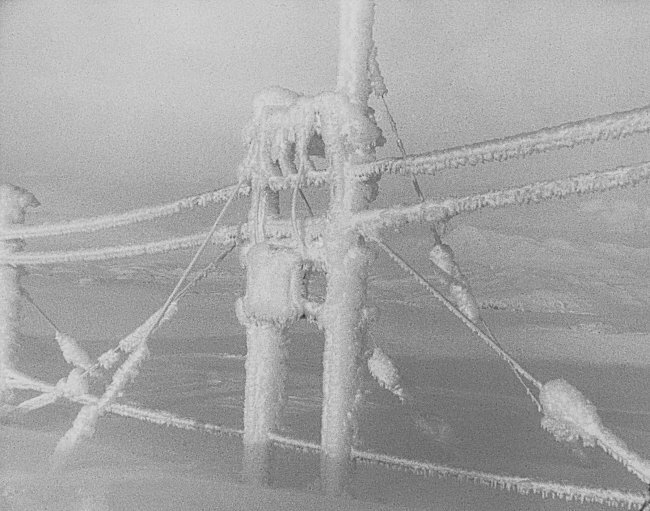 The fourth of July storm caused heavy icing on many power lines. 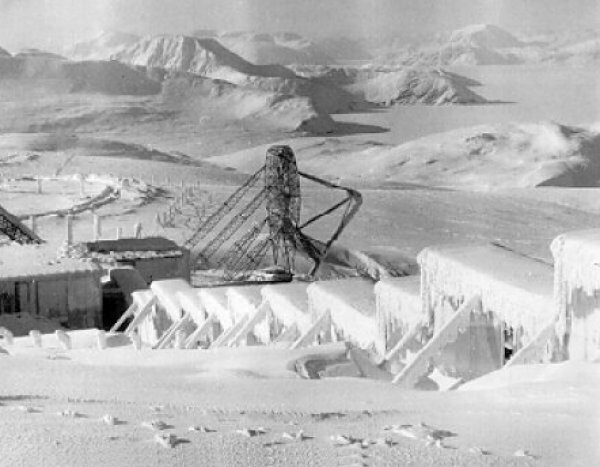 In some places ice on the lines reached a diameter of ten inches. The storm on the twelfth of July, though not as damaging as the other, deposited three-foot snow drifts on the road from the site proper to the lower camp. Because of the drifts, the road was closed for two days, seriously hampering water-hauling activities. The most damaging weather occurred on 13 September. Winds reached a velocity of more than one hundred and twenty miles per hour. 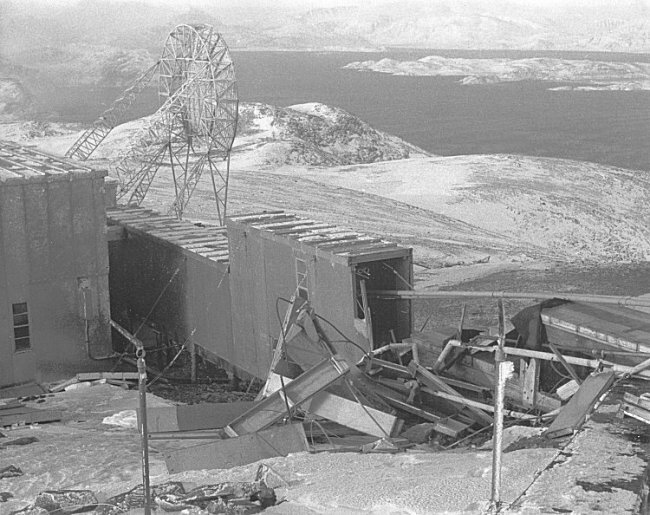 The Radome tore and collapsed at approximately 0420 and eight hours later the radar components housed in the dome were damaged considerably. Weather conditions for February were no worse than could be expected with only two storms having winds above average. The first storm with winds averaging 80 miles per hour and gusts up to 100 miles per hour started on the 19th and lasted approximately twenty-four hours. The second storm came about a week later with winds averaging 70 miles per hour and gusts up to 90 miles per hour. Very little damage occurred during either of these storms. One anemometer was lost and part of the outer fibers over a patch on one of the radomes was torn loose by the first storm. There was no loss of air pressure. 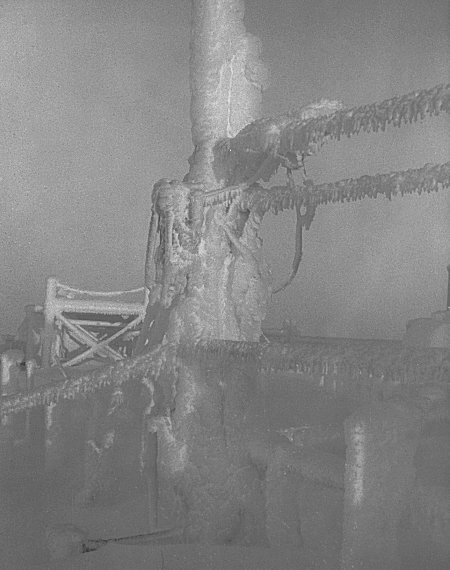 An ice storm can cause considerable damage to equipment - November 1957. 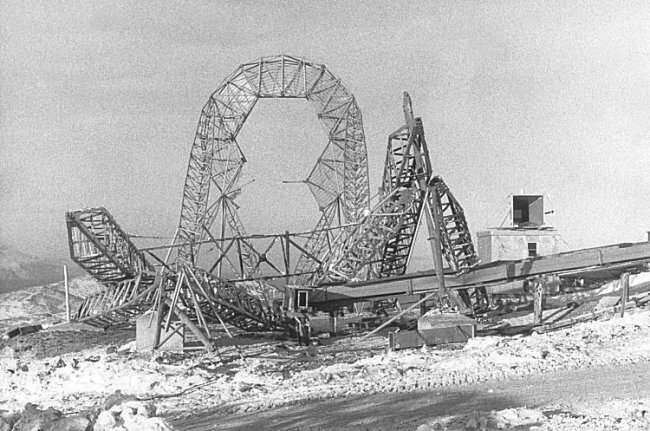 Results of an ice storm - November 1957. 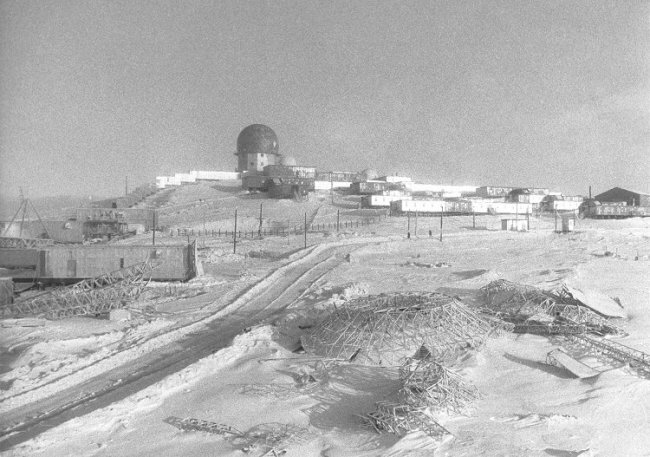 Snow and ice - November 1957. 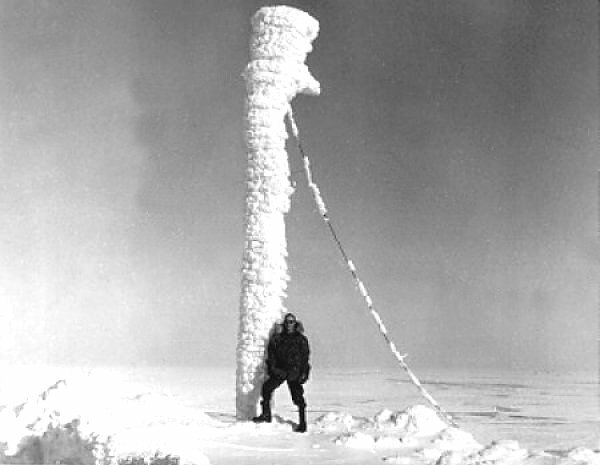 Telephone pole covered with snow and ice - November 1957. 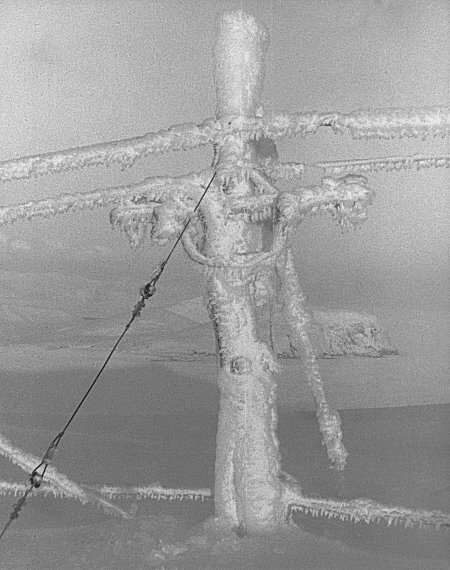 Power lines covered with snow and ice - November 1957. 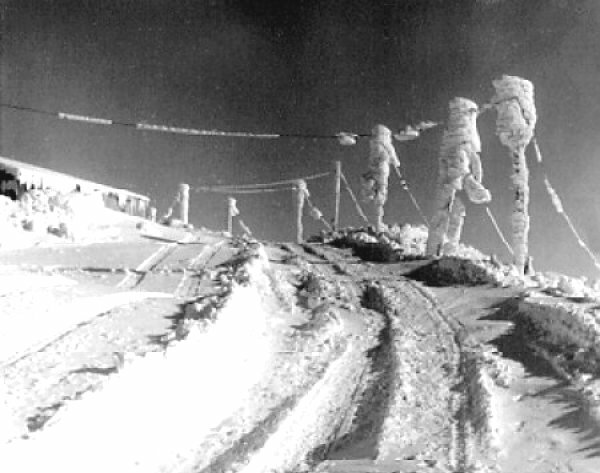 Power lines covered with snow - November 1957. 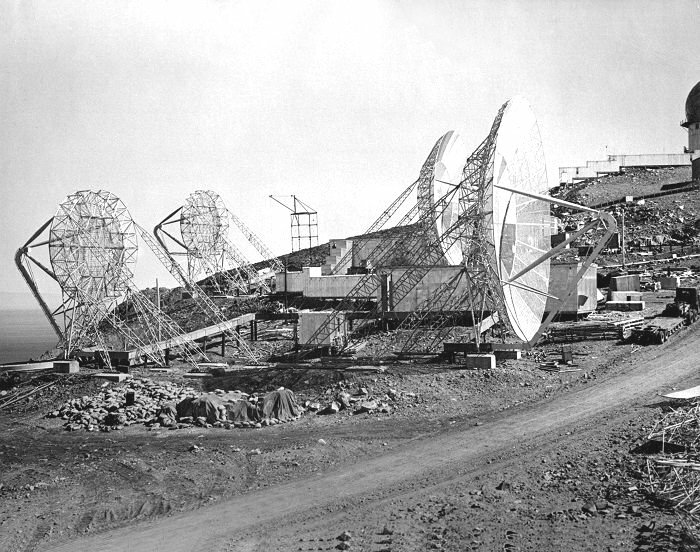 Communications antenna - November 1957. 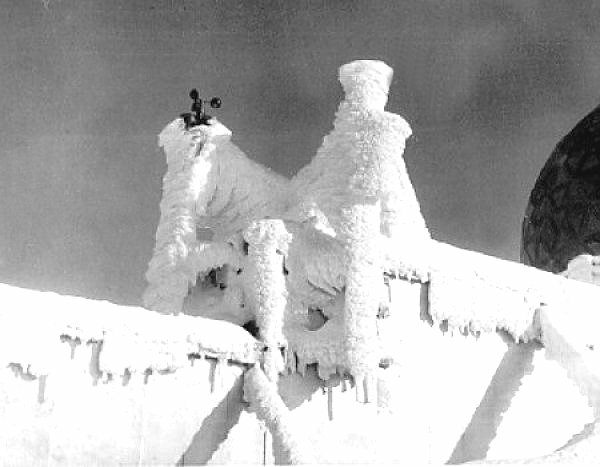 Extensive damage caused by an ice storm - October 1957. Larger image of previous photo - October 1957. 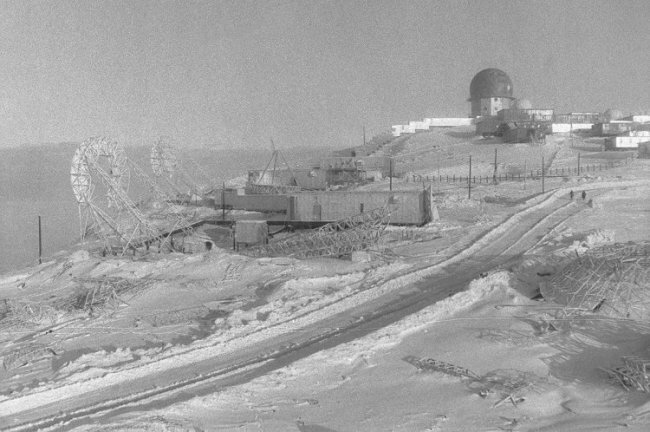 Another view of the damage caused by the ice storm - October 1957. Larger image of Saglek AFS - October 1957. 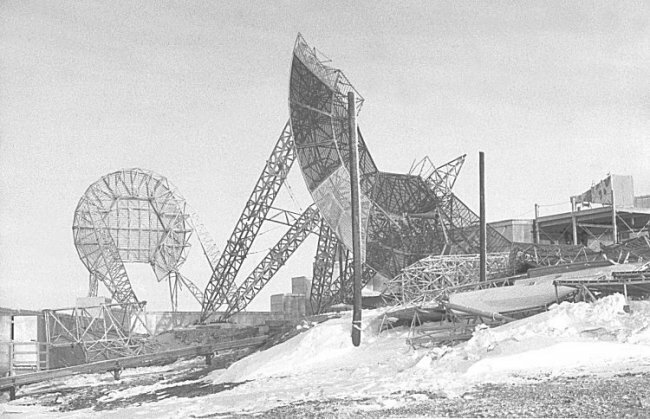 Troposcatter communications antennas damaged by the ice storm - October 1957. 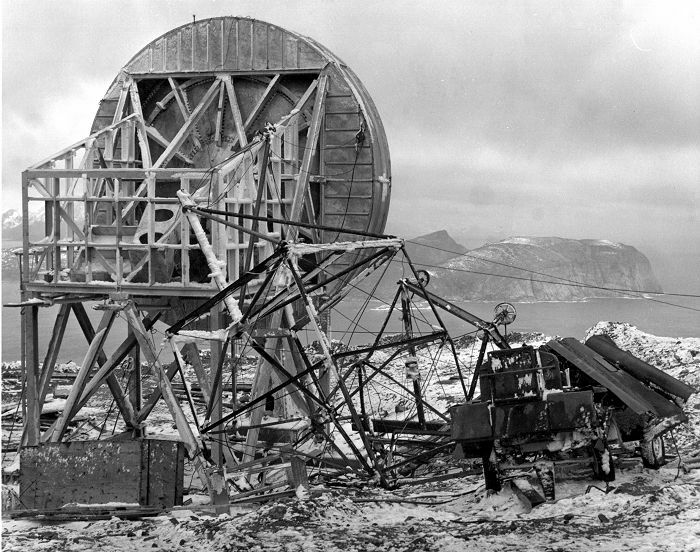 Troposcatter communications antenna damaged by the ice storm - October 1957. Damage to a "walkway" connecting buildings caused by the ice storm - October 1957. 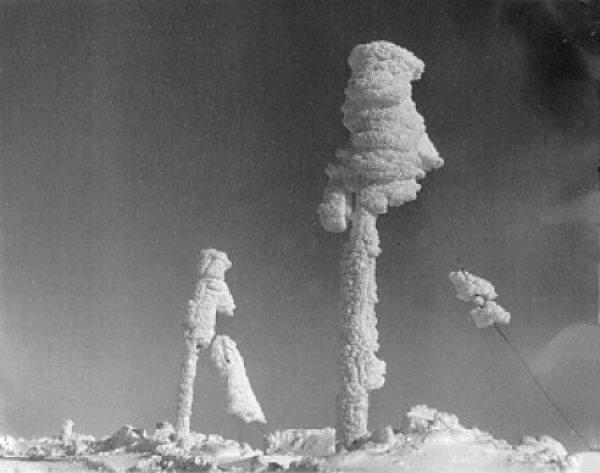 Damage to Troposcatter communications antennas caused by the ice storm - October 1957. 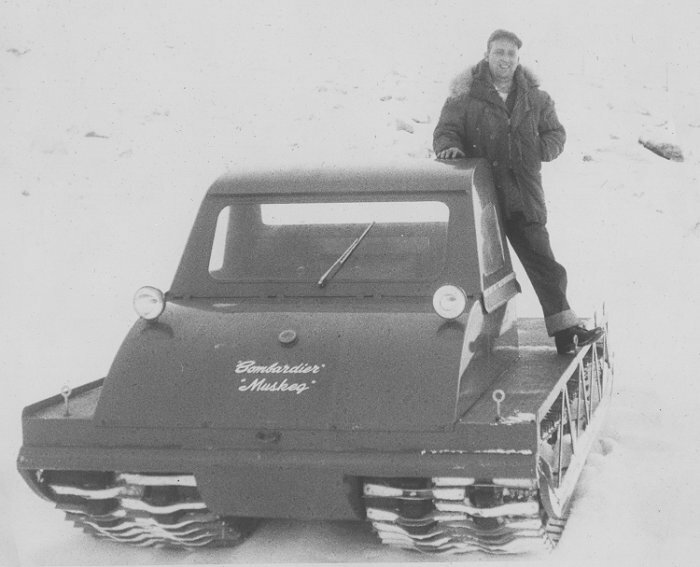 This "Bombarier Muskeg" replaced the one that plunged 1700 feet off the mountain during a whiteout - October 1957. Miraculously, the one civilian and two GI's all lived. The corridor between the AC&W Squadron buildings and the Polevault communications buildings was destroyed during a storm. 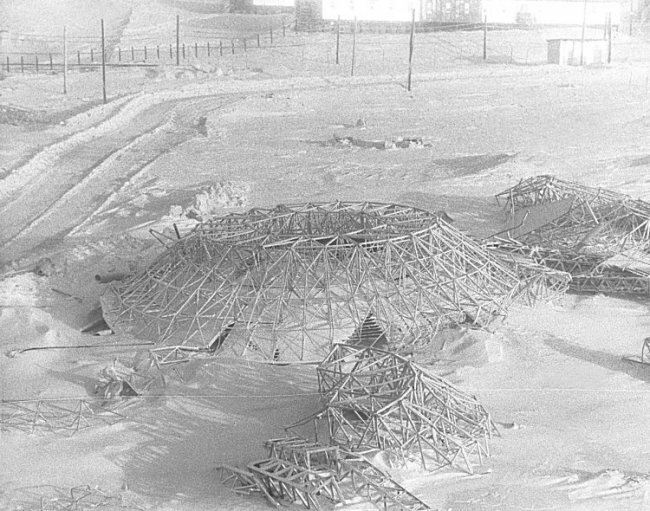 The Polevault antennas (used for Tropospheric Scatter Communications) were demolished, approximately one third of the power building roof gone, door to building gone – all as a result of a storm consisting of snow, ice and high winds. 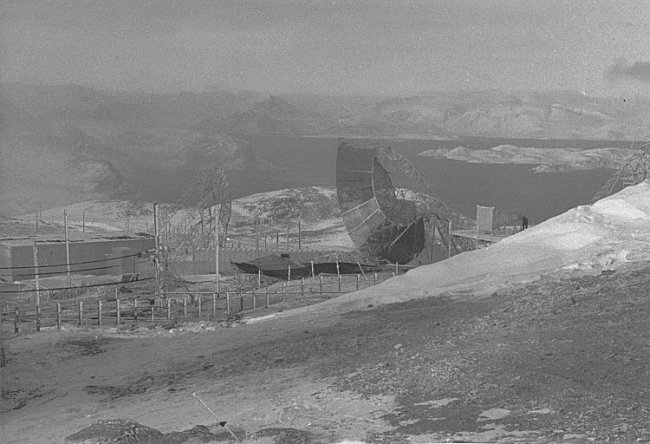 Photo showing "Polevault communications antenna" before the storm when new antennas were being constructed - note scaffold in background - August 1959. - Courtesy Dennis Abbott. A major storm hit the Saglek Bay area on 24 January with winds estimated at approximately 200 knots per hour. Although there were no personal injuries, the base suffered extensive damage during the ten hour period of the storm. The POL pump house at upper camp was completely demolished and several pieces of electrical and mechanical equipment were destroyed. 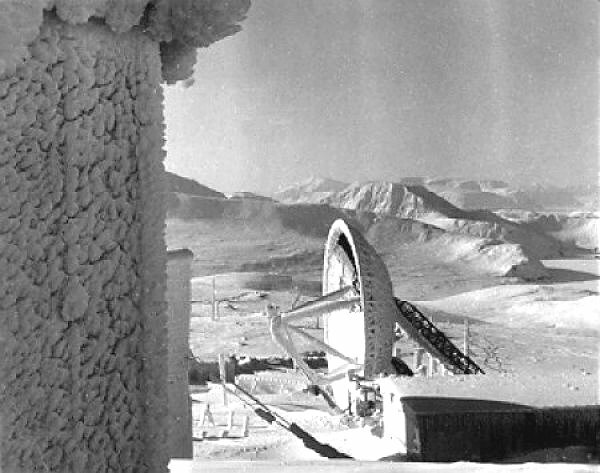 An estimated 75 window panes were broken by flying debris and the force of the wind damaged several walls and roofs both at lower and upper camps. The severe force of the wind was indicated by the dislocation of the Ric-Wil line approximately 300 feet from its original position. 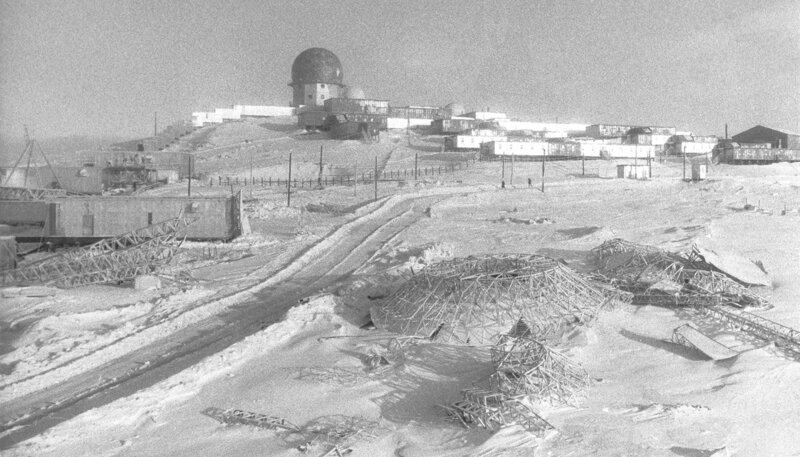 Throughout the duration of the storm, radar and radio equipment remained in operation and no major problems were encountered. A mobile maintenance team consisting of two carpenters and one electrician arrived on 27 January to augment and assist local maintenance personnel in repairing the damage. 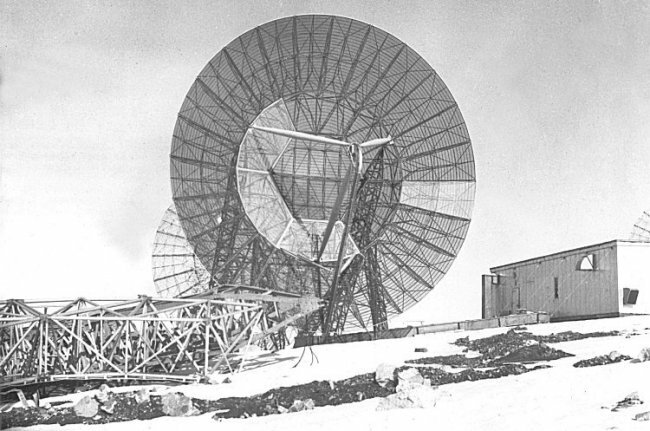 The HF radio antennas, which had been torn down by high winds and icing, were reinstalled. They were blown down a few days later by excessive icing and high winds. A future attempt will be made to reinstall them. Colonial Briard construction crew arrived on 2 September to repair the storm damage on the Multi-Purpose building which consisted of one complete exterior wall. This involved the installation of metal siding and new asbestos wall board on the inside. This work was completed 23 September. HF antennas were reinstalled after high winds and icy conditions broke them during the last quarter. High winds (in excess of 125 knots) on 16 August tore the roof off the NCO lower barracks. On 4 October, winds in excess of 200 knots were measured at this station. These winds tore off an 8x12 foot section of roofing and tore a large hole in the north wall of the gym. On 5 October high winds in excess of 200 MPH were experienced at this station. 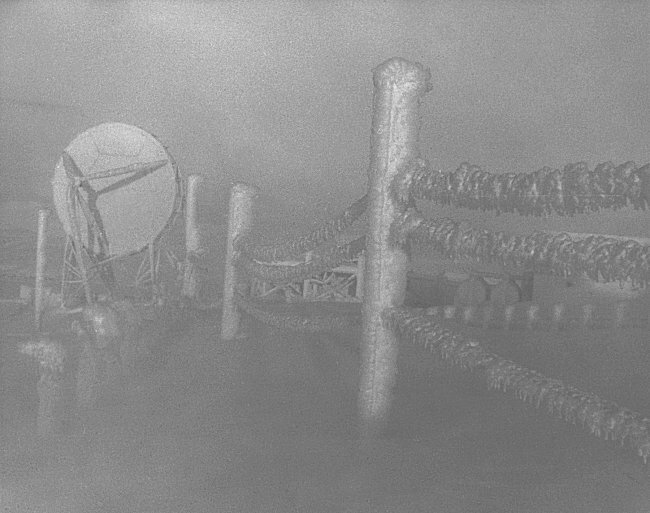 Due to these high winds the Base MARS Beam antenna was completely destroyed beyond repair. On 7 December, high winds struck again in excess of 200 knots. An 8x16 foot section of roofing was torn off the gym. Repairs were completed in two days. The Mobile Maintenance Team completed various repairs and projects while on station, including the project which consisted of modifying the gym exterior north wall to lessen the possibility of high wind damage. Saglek experienced a bunch of severe wind storms during February. On George Washington's birthday, twenty-three men were returning from meeting an aircraft when a sudden and severe wind storm (150 knots) engulfed them. It was impossible to travel so the five Trackmasters waited for 14 1/2 hours before visibility improved enough for one Trackmaster to make it back. The other men were then picked up. It took four days the retrieve the Trackmasters which had engines full of snow and clutches frozen solid. The gym escaped damage for a change. The Radio Maintenance section was happy to be the hosts of the QC inspection team during the first high winds of the season. 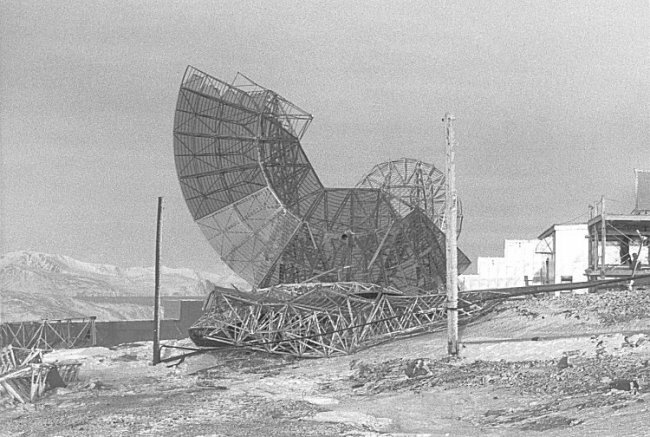 One of the MARS antennas was the only loss suffered by radio during the wind storm.